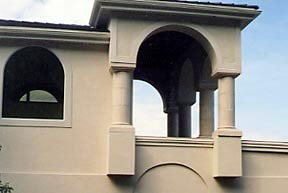 Columns on this home were 6' tall and in two diameters: 24" and 18"
Precast concrete columns are modular in design in order to be made into different heights. Widths are 12", 18" and 24". Columns are not structural, but can be used as such only after a structural engineer has adapted them to a building. Half columns can also be used against a building which can add variety to the architectural design. 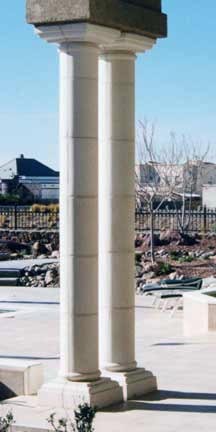 Columns are available in these standard colors and other desired colors. Colors may vary depending on monitor resolution.